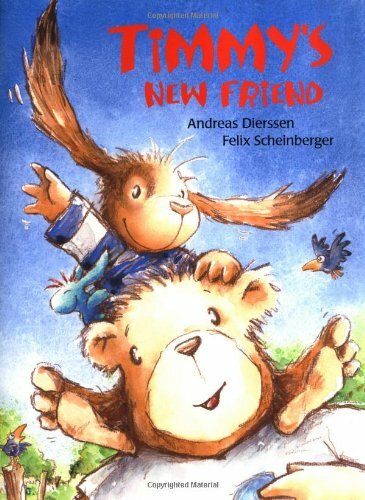 Timmy’s New Friend was first published in Switzerland, with the name “Toddels tollster Freund.” Even the English version at my public library was printed in Belgium, according to the title page, though it doesn’t say who translated the text. So “Toddels” became “Timmy”, though he’s still a little rabbit wearing a sweater and playing happily with a red ball. He’s playing with another rabbit friend — “Rocket” in this version — when they hear twigs cracking in the forest behind them. It’s a cute little bear cub named Bruno standing in the sunlight and wearing a football jersey. He wants to play with the two rabbits, and he can throw their red ball even higher. Unfortunately, it gets stuck in a tree, and the three animals have trouble getting it out. They try standing on each other’s shoulders, with Timmy reaching up with a long stick, but Timmy slips and falls to the ground. The funny illustrations by Felix Scheinbergerare what make this book so entertaining. For example, Timmy’s got a frazzled expression as he hits the ground, with his ears laying flat, sticking out in both directions. But he’s got a hopeful, friendly smile when he first meets the bear cub. Besides the funny caricatures, the illustrator also uses lots of interesting perspectives to create a sense of depth for the peaceful forest where the animals are playing. The bear has another idea for dislodging the ball from the tree — catapulting the two animals into the sky by jumping on one end of a seesaw. The bear smiles confidently, and closes his eyes with pride as he leaps. But it only results in a very funny drawing of the animals hurtling through the dark blue sky, with one rabbit grimacing in fear and the other tilting their head back and screaming. In the ensuing chaos, the bear even squashes the rabbit’s red ball accidentally. The bear meant well with everything he’d done, but each time it ended in catastrophe. The story was written by Andreas Dierssen, and he’s ultimately teaching a lesson about forgiveness. But it arrives subtly, and he seems to spend a lot more time showing just how angry the young rabbit is — and why. It’s only in the book’s last pages that the burly bear redeems himself by rescuing the rabbit from a bullying fox. And it turns out on the last page that he’d brought a brand-new ball to make up for the mishap, and the book ends with the three animals friends playing happily together again.